I have always and will forever love books about Fairies living among us. Though many such books have disappointed me in the past Of Stardust did not let me down. February Grace's protagonist, Till, is a girl after my own heart. 26 years old and still living with her parents and working in their bookshop she feels that her life has stagnated. She has no clue as to what her purpose is or what she has to offer the world. Until she is summoned to the home of her Great Aunt Tilda (her namesake) that is. That's when the bombshell is dropped, she is a Fairy Godmother. As Till's tale moves forward Grace does a phenomenal job of fitting the fairy world into our own. How do fairies do their job and maintain a job that helps them blend in to the world? Well they don't sleep of course! And while that sounds awesome (think how much you could get done with 24 hrs a day available to you) Grace also is sure to point out the disadvantages of such a situation. Without sleep there is no chance to dream. One of the biggest disadvantages of being a Fairy Godmother, though not the biggest disadvantage. The biggest disadvantage is that Fairies Godparents must remain celibate forever and with a life span of 300 years or more that can make a Fairies lifetime one that is very sad and lonely. I loved the fact that Till continually voiced her disagreement with such a rule. With the fairy line dying out she points out that the only way to create more fairies is to procreate with other fairies. How can you not fall in love with a character that voices her opinion repeatedly consequences be damned? And how could Till not voice her opinions when she finds herself falling in love? The romance that blossoms between Till and her tenant Gus is wonderful. Forever denying themselves that which they want the most to fulfill their destinies is heart-achingly beautiful. At times their heartache brought tears to my eyes. You want to root for them. You want them to find some loophole that will allow them to be together for good, not live and work together side by side without ever obtaining the one thing their hearts cry for loudest and most persistently. Of Stardust is a wonderful book for all ages. Lovers of magic and romance will find themselves swept away in this delightful novel. February Grace is a writer, artist and poet who lives somewhere that is much colder than she would like most of the time. She sings on key, plays by ear, and is more than mildly obsessed with music, clocks, colors, and meteor showers. Her poetry, prose, and/or flash fiction have appeared in The Rusty Nail Literary Magazine, Vine Leaves Literary Journal, and Rose and Thorn Journal. 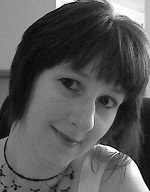 Her work can also be found in the following anthologies: Poetry Pact Volume One, Anything Prose...And Poetry, Too! and Orange Karen, Tribute To A Warrior. GODSPEED, her debut novel, is a labor of love she refers to as "Literary romance with steampunk embellishments." 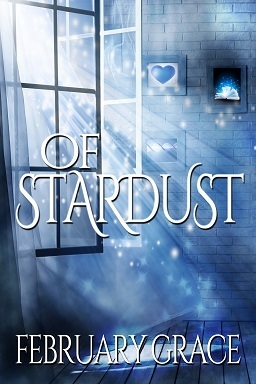 Her second novel, OF STARDUST, is a modern, romantic fantasy tale. Thank you so much! I really appreciate you taking the time to read, review, and post a stop on the blog tour. I am so happy that you enjoyed the book :~) Thanks again!